Mead Avenue Bridge in Meadville, Pennsylvania. One of the most unique bridges in the US and perhaps even beyond. 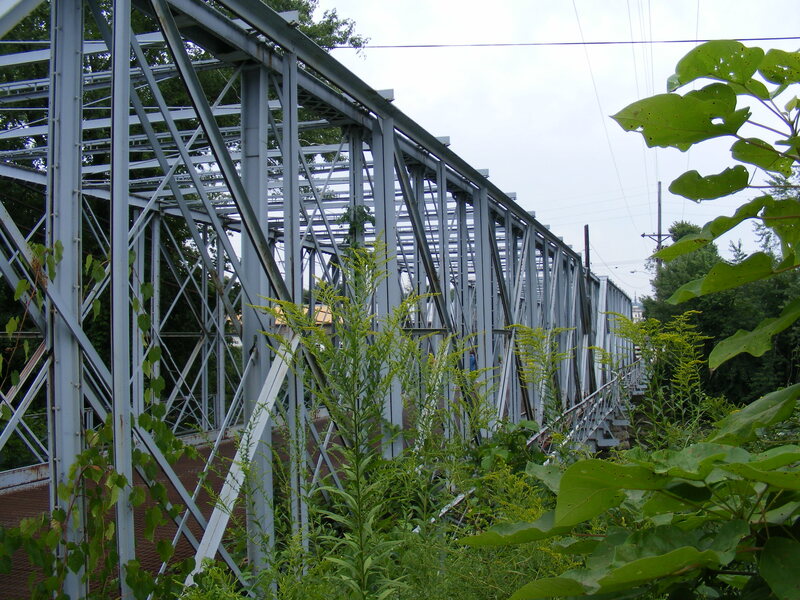 Spanning French Creek, the two-span through truss bridge featured an 1871 worught iron Whipple span encased with a 1912 Baltimore span. When I visited the bridge during the 2010 Historic Bridge Weekend, the blue-colored span was closed to traffic with a bleak future in its midst. The majority of the city’s population wanted the bridge gone. But efforts were being undertaken to try and preserve at least half the span. This bridge was the first one profiled in the very first aricle I wrote for the Bridgehunter’s Chronicles blog, when it was launched in October of that same year. Click here for the article. Fast forward to the present and the situation has changed completely. The bridge is being profiled again as the first article produced by the Chronicles as a website, yet the bridge is no more. Most of the historic bridges like this one would be cut up into pieces and hauled away to be recycled. In Pennsylvania it is no exception for many of them are being replaced through the rapid replacement program initiated by PennDOT and many bridge builders in the private sector last year. Yet a last-minute attempt by one pontist has paid off. The bridge is being distmantled, the parts will be hauled, BUT it will be relocated. The question is how? The Chronicles had a chance to talk about the plan to restore the bridge with Art Suckewer, the pontist who is spearheading the efforts and pulled off the last minute trick to saving the artefact from becoming a thing of the past. What he is going to do with the bridge and the challenges that he and his crew are facing at the moment you can find in the interview by clicking here, which will direct you to the Chronicles’ website. How did you become interested in historic bridges in general? I always liked them since I was a kid but never thought of them as more than a neat part of the scenery until recently. After purchasing a farm property in a historic district with several stream crossings, I researched my options and discovered that acquiring an old truss bridge was a viable solution. I learned a lot through your website, bridgehunter and historic bridges. Through speaking with Julie Bowers, Nathan Holth and Jim Cooper, I learned what was involved and received enough guidance to try to acquire one. While Mead Ave. was on my list, I thought it was too big of a project, and Vern Mesler was going for it so it seemed like it would be preserved. Instead I went for the Beatty Mills Bridge and the Carlton Bridge as my primary and back-up selections. Little did I know I’d get them both! 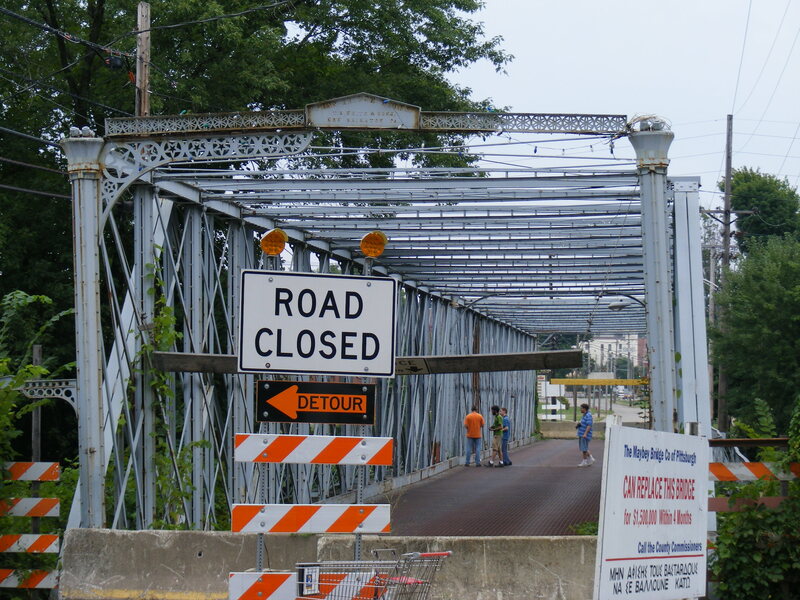 What got you interested in the Mead Avenue Bridge in Meadville? What is so special about it in your opinion? Your website, bridgehunter.com and historic bridges.org brought it to my attention. What is so special is that it still exists, that it was very decorative (none of the websites show the bridge with its original spires – look at pictures/ woodcut prints of the Azuma Bashi Bridge in Japan if you want to get a sense of what this bridge once was) and that even though it is a Penn Bridge Co. bridge it represents the last example of an early, long span Keystone Bridge Co. design. 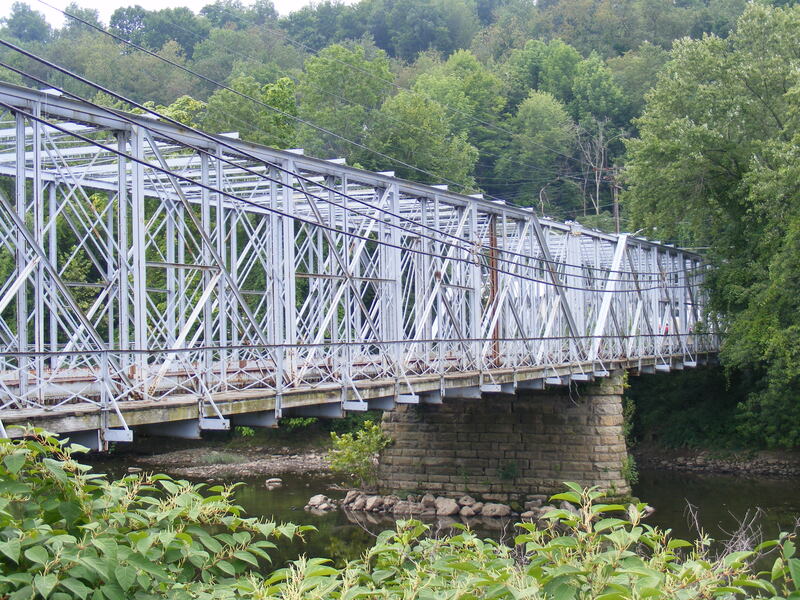 I am now 95% certain that it was built by Keystone Bridge Co. to Jacob Linville’s 1865 patent as a kit to be erected by Penn Bridge Co.
How did you purchase the bridge? Vern Mesler was going to take it but he had difficulty getting his plan approved due to very sensitive environmental issues (I still think his approach was the best way to go). Once Vern gave up, I stepped in because I feel strongly that the bridge should be saved. I think because I established credibility with PENNDOT in recovering two other bridges successfully (thanks to Nels Raynor, Nathan Holth, Jim Cooper and Ross Brown), my engineering background and experience in writing proposals and working with government agencies gained from my day job, they gave me a shot. I had pursued the recovery for nine months with serious efforts beginning in August. That said, it didn’t come together until after it was already too late and ownership had been transferred to Mekis (the prime contractor for the replacement) but with Mekis’ support/flexibility and strong support from PENNDOT, especially Kara Russell and Brian Yedinak, and Ross Brown’s inspection of the bridge and willingness to attempt my plan to reinforce the 1912 Baltimore truss as a falsework and disassemble the 1871 Whipple in place did we get the go ahead. We had less than two months and Ross worked 10 – 12 hour days 7 days a week to pull it off but the 1871 structure has now been successfully removed. The remaining structure will be lifted by crane by Mekis then disassembled by Ross and removed by May. What difficulties did you encounter? The plan we were allowed to pursue was the most difficult and risky approach. Finding the funds was tough. Due to the lateness, Ross had a very narrow window to pull off the job and it ended up being one of the worst/coldest winters in memory. Also, the bridge had lots of previous improper repairs that made Ross’ job much more difficult. What are your plans for the bridge? What are the places you want to relocate the structure? While I have committed to putting the bridge on my property and I do have a place for it, I consider that to be a placeholder. Ideally I’d like to find a home in a northwestern Pennsylvania town as a pedestrian walkway within a town as part of that towns revitalization. Alternately, a public use elsewhere. We have some leads. How much rehabilitation will be needed before the bridge is reconstructed? A lot. The bridge is suffering from a thousand improper repairs as well as differed maintenance. However, the project is doable because the quality of the castings, both in tolerance and material is extraordinary – definitely benefitting from the demands of James Eads on Andrew Carnegie to meet his exceedingly high quality standards for the Eads Bridge as both bridges construction periods overlapped. When will we see the reconstructed bridge next time? Within ten years (if it is reused for a public purpose then it may be soon; if no one else wants it, I’ve got two other bridges to fix first so it will be a while). Any advice you would give to any party interested in preserving a bridge, regardless of whether it is in place or if it needs to be relocated? Look at all options; be flexible; listen to the experts (especially the craftspeople); be patient yet persistent; leverage your resources; be prepared to walk away – you can’t win them all; If you think ‘someone should…’ ask yourself if that someone is you. Good luck to Art and his crew as they continue with the project. The removal and disassembly part is just the first of many phases that will be done during the 10-year frame he’s mentioned. There are many more to come, and if there is a proverb to end this article, it is the song produced by the East German music group Karat entitled “Über sieben Brücken muss du gehen.” (You must cross seven bridges) There, the person had to cross seven bridges spanning the worst of ravines in order to reach his destination. This is what Suckewer and crew are facing with the Mead Avenue Bridge. But after the seventh bridge is crossed and the newly restored Mead Avenue Bridge is in place, the efforts will pay off in the end. Even if the seventh bridge is out and there is no place to relocate the bridge, there will be many attempts to make sure that the restored bridge finds a new home and someone who will take care of it and use it for his purpose. But before we speculate, let’s watch, wait and see how this next chapter, the one after a rather happy ending in the current one we’re reading, unfolds. The Chronicles will keep you posted on the latest. 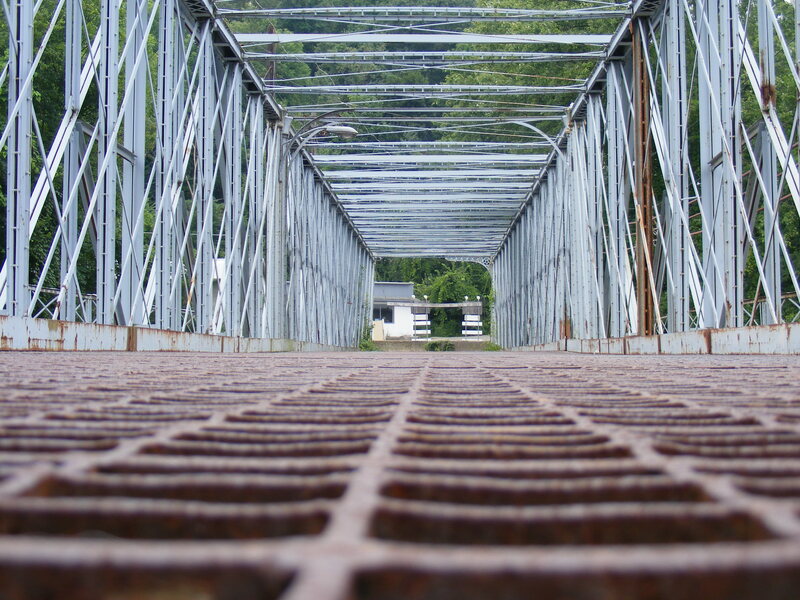 Note: More photos of the Meadville Bridge are available via flickr. The Bridgehunter’s Chronicles Now a Website! Confessions of a writer: Sometimes being away from something you do helps you think of something bigger and better. The past couple months have witnessed not many postings direct from the Chronicles, and for a good reason- the online column is growing up. Once considered a blog that has attracted many readers on facebook, twitter and through direct subscriptions, the Bridgehunter’s Chronicles now has its own website, powered by WordPress. Disregarding the new photos on the website, including the pages, the format of the Bridgehunter’s Chronicles remains the same as it focuses on historic bridges, ways to preserve them and places to visit where they are plentiful in number. There are a couple differences that are key to telling the new website apart from the blog. The website version will focus more in detail on some of the larger aspects of historic bridges. This includes articles pertaining to historic bridge preservation practices, tour guides of regions with a high number of historic bridges, information on bridge preservation projects, interviews with experts, etc. Some of the tour guides produced in the blog version will be reproduced in the website version thanks to the newest feature: Google Maps, which will help you find the historic bridge much easier than using an ordinary map, let alone taking some guesses as to where they are located. Since it also has a polling feature, the website version will utilize this for questions for the forum, as well as for the upcoming 2015 Ammann Awards. This way, people can easily be directed to the polls from the article. The blog version will remain as is, except its role will focus mainly on Newsflyers, updates on historic bridge projects, tributes to historic bridge greats, questions for the forum that do NOT require the use of the polls, announcements of special events pertaining to historic bridges, photography, conferences, etc., and anything of importance that only requires up to a page to write. For articles to be posted in the website, an abstract of them will be featured with a link directing you to the article on the website. These you will find through AreaVoices, an online community that is part of the InForum family. So in short, if you want to know which of the two Bridgehunter’s Chronicles types you should subscribe to, the answer is simple: subscribe to BOTH versions to get the best coverage. However, all articles from the two versions will continue to be posted in the Chronicles’ facebook pages as well as twitter. To play it safe and follow the updates of bridges from various sources posted, subscribe to the Chronicles on both facebook and twitter. A third social network page, like tumblr or Reddit for example is being considered, and once that is launched, you will be informed here on the Chronicles. Even though the Chronicles has eliminated the Guest Writer page for the website and will do so for the blog version as some clean-up will be needed, we are still looking for featured writers to submit articles on historic bridges and other themes associated with them. If you have an article you wish to have posted for the readers to see, please contact Jason D. Smith at the Chronicles at: flensburg.bridgehunter.av@googlemail.com, or use the contact form in the About the Bridgehunter’s Chronicles page. You can also post the inquiry on the Chroncles’ facebook pages. Last note before going to a rather bitter sweet story involving one particular historic bridge, the Chronicles’ facebook page features two different pages: the main page and the group page. The group page will remain as is, providing information on historic bridges in the US with a platform where you can provide questions for others to discuss. If you want to join, please ask the administrator, and you will be welcomed with open arms. The main page is where you can read up on all the articles on historic bridges from the Chronicles as well as other online sources. There you can Like to follow for more coverage. The goal is to reach 500 Likes by the end of this year. Given the number accrued so far, that goal is realistic, esp. if word goes around from readers like you. The Chronicles welcomes any comments and suggestions pertaining to the website. If you would like to see some changes, please let the author know. Now without further ado, let’s go to a story about one bridge that had been closed for many years, but now has a happy ending. Hint, this bridge was the first written for the blog version, when it was launched five years ago. Any guesses of what the name of this bridge is, let alone where it is located? The blog version will remain as is, except its role will focus mainly on Newsflyers, updates on historic bridge projects, tributes to historic bridge greats, questions for the forum that do NOT require the use of the polls, announcements of special events pertaining to historic bridges, photography, conferences, etc., and anything of importance that only requires up to a page to write. For articles to be posted in the website, an abstract of them will be featured with a link directing you to the article on the website. 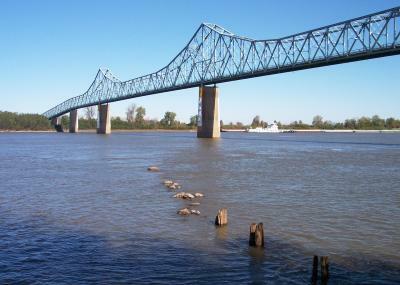 CAIRO, ILLINOIS- It is a prized landmark at a town where the Ohio and Mississippi Rivers meet. 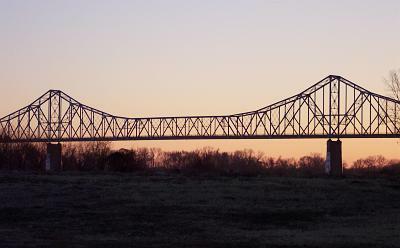 Built in 1929 and is a product of the American Bridge Company and the Missouri Valley Iron Works Company, it spans the Mississippi River right at the junction of the two rivers. The Mile-Long Bridge has seen its years of wear and tear, especially as commuters have to endure two lanes of traffic-narrow enough to a point where the mirrors of oncoming cars meet while crossing, as many motorists have complained about- and as truck drivers have to abide by the weight restrictions- something almost no one does nowadays. It has even been affected by the floods of 1993 and 2011 but survived with little or no damage to the piers. 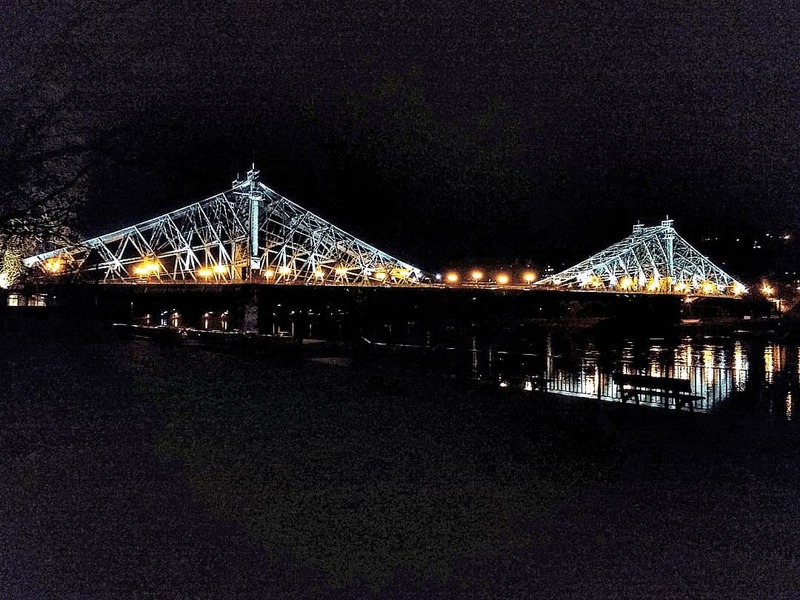 Now the Cairo Bridge, the key bridge for the town located at the junction of three states- Illinois, Kentucky and Missouri is now closed for a whole year, as the steel cantilever Warren truss span with X-frame portal bracings and riveted connections undergoes a much-needed renovation. 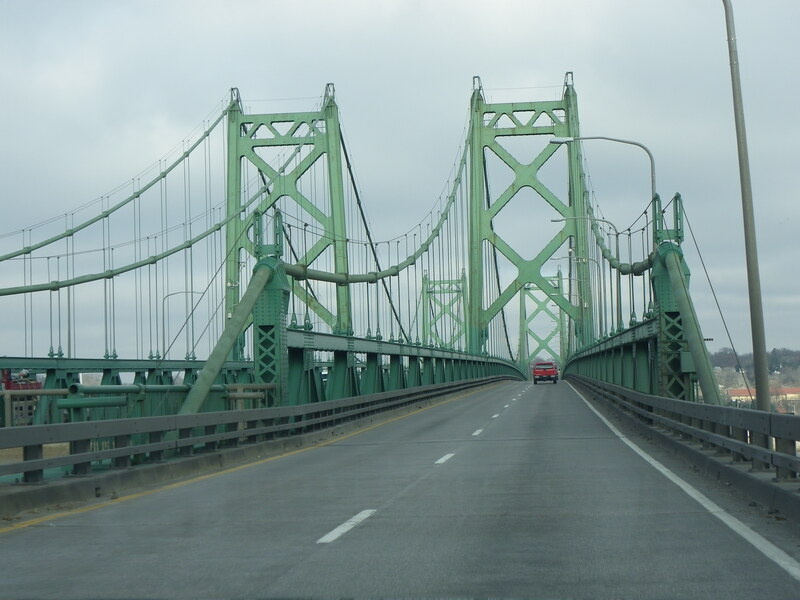 According to information by Missouri DOT, some of the repairs will include replacing the bridge deck to make it sturdier and wider as well as replacing some structural parts worn out completely due to wear and tear. It is unknown how expensive the renovations will be, but it is expected to be in the tens of millions of US-dollars. The Bridgehunter’s Chronicles will keep you posted on the latest developments involving this bridge. In the meantime, enjoy the gallery of photos posted by James Baughn and others just by clicking on the pic below, which will take you to the Bridgehunter.com site. RENDSBURG, GERMANY- It’s one of the longest and highest bridges in Schleswig-Holstein: 1457 meters long, 30 meters wide and 50 meters high above the Baltic-North Sea Canal. The Europabrücke, locally known as the Rader Hochbrücke, is one of the most heavily travelled bridges in northern Germany, carrying the main artery connecting Flensburg and all points in Scandanavia to the north and Hamburg and all points to the south, the motorway A7. 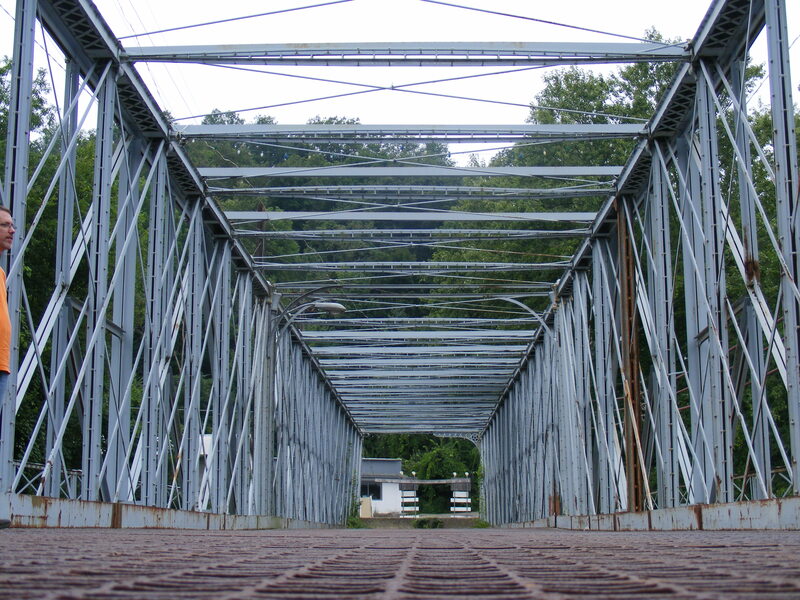 Built in 1972, the cantilever deck bridge has reached the end of its useful life. Unlike the April Fools joke involving neighboring Rendsburg High Bridge in 2013, this is a serious matter. According to sources from shz.de, plans are in the making to replace the bridge with a wider and sturdier structure with plans to have the structure replaced in 12 years’ time. Two factors influence the decision by the Ministry of Transportation in Berlin and the state authorities in Kiel to replace the 43-year old bridge. First and foremost, inspection reports revealed wear and tear on the bridge’s deck, caused by extreme weather conditions, salt and debris from the canal it spans and lastly, too much traffic on the bridge. The bridge was closed for several weeks in 2013 because of spalling cracks in the concrete that needed to be patched. This resulted in chaos for travellers needed to detour through the tunnel in Rendsburg, the transporter portion of the Rendsburg High Bridge in order to get across or even the ferries near the city, just to name many alternatives. The second factor for the bridge replacement is because the motorway is being widened from its present four lanes to six lanes, between Hamburg and Flensburg. Already underway is the stretch between Neumünster and Quickborn, the widening process will include replacing over four dozen bridges built in the 1950s, widening the present lanes and adding one additional one in each direction to ensure that travelling this stretch is safer than before. This stretch of A7 has been notorious for several accidents and traffic jams, especially near Hamburg. The bridge replacement will be part of the next stretch of highway to be widened. While the design-phase is in its infancy, the plan is to build one half of the replacement span wide enough for four lanes of traffic. After shifting traffic onto the new span, the old span will be torn down and replaced with the second half of the replacement span. The plan is to have the bridge completed by 2027. Yet pressure is being applied by German Transportation Minister Alexander Dobrindt to start construction of the new bridge as soon as possible, giving designers up to 18 months to complete the process before construction starts. The project is being considered for federal support by officials in Berlin. How long the designing process and the impact surveys will take place as well as when construction will start remains open. But given the critical situation of the bridge and the motorway, the bridge will most likely move up the priority ladder quickly so that work can start at the latest next year. Judging by the bridge’s modern appearance, from the photographer’s and pontist’s point of view, the bridge appeared to be functioning great and its sleak design makes it one of the crossings worth seeing while biking aling the Grand Canal. However, looks can be deceiving when looking at the cracks in the concrete. Given the recent bridge collapse in Cincinnati a few weeks ago, politicians and engineers are wasting no time getting the project moving forward in Rendsburg. The Bridgehunter’s Chronicles will keep you posted on the latest with the bridge. Together with sister column The Flensburg Files, a series on projects in Schleswig-Holstein is being produced to give travellers an idea what to expect in the coming months. A series on the Bridges along the Baltic-North Sea Canal was produced by the Chronicles. The Europabrücke is found here. The Flensburg Files is doing a quiz series on the 16 German states as part of the country’s 25th anniversary celebration. The first one on Schleswig-Holstein you can find here. The answers will come on 24 March. And like the Files, The Bridgehunter’s Chronicles is currently undergoing an upgrade to internet status. Articles will continue to be posted during the construction proces, which is expected to take a few weeks to complete. So stay here and enjoy the articles to come. Burg (Fehmarn)- In the last 20 years, attempts have been made to turn the largest island in Germany, located northeast of Oldenburg in Schleswig-Holstein at the border to Denmark, into an industrial area, especially in the northern half of the island. And since last summer, a petition was made to put the proposal up to vote, which was granted on March 8. The question was whether profits from the new industrial area would make sense or whether it is best to keep the island as is and feed its profits from tourism and environmentalism. In other words, do they want the industry or not. The majority spoke for the latter- and by an enormous number of votes! Voters on the 8th voted unanimously to reject the proposal by the conglomerate Baltic FS to establish an industrial area in the northern part of the island with an average vote of two thirds favoring the annullment of the agreement with the firm and less than a third for the agreement. The plan would have allowed companies to establish their facilities on 15 acres of land between Puttgarden and Marienleuchte, which would have resulted in the widening of the Migratory Route (Vogellinie) between Hamburg and Lübeck to the south and Copenhagen in the north. The majority that voted against the proposal were concerned about the increase in air and noise pollution caused by the establishment of several small firms as well as the subsequential increase in traffic, and that the environmentally sensitive region would sustain significant damage as a result. Proponents of the proposal wanted additional revenue to that coming from the tourism section, which is the main source of income. Yet because of the haste in planning by Baltic FS combined with questions about the affects of the Areal being answered vaguely or even left out, the majority of the residents of Fehmarn voted to cut the cord on the deal. The proposal, according to the news source Fehmarn Heiligenhafen is now on ice for at least two years, but attempts are being made by the Initiative Bewahrt Fehmarn (Preserve Fehmarn) to ensure that the Areal plan is off the table for good, together with the widening of the Vogellinie route and with that, a new bridge over the Fehmarn Sound to the south west of Burgstaaken and a new tunnel to the north at Puttgarden. Should this plan be successful, it is most likely that the Areal may be scrapped or even relocated. The Danish town of Rodby in Lolland may be the best place for the district, if the latter is proposed, given its strategic location. Fehmarn Tunnel and Bridge on Ice? In addition to the good news regarding the Areal, work on the Fehmarn Tunnel between Puttgarden and Rodby (Denmark) as well as the proposal for building a new Fehmarn Bridge between Burgstaaken and mainland Germany has been stalled for political reasons. According to sources from the Lübecker Nachricht newspaper as well as from the Initiative Bewarht Fehmarn, work on the new 18-kilometer long tunnel will most likely start in 2018 with the completion being in 2024. This will be three years later than scheduled. Reason for the delay is the debate on the future of the Fehmarn Bridge on the south end. According to an article produced in December, the 1963 basket-weave tied arch bridge was the very first bridge of its kind built, setting the stage for several more similar structures that have been built since then and three more to be built in the next five years; one of which is the Levansau Bridge west of Kiel. The German Railways (Die Bahn), owners of the bridge, wants two new bridges- one for railway traffic and one for the motorway and relieve its duties in maintaining the bridge- possibly even tearing it down. Residents are against the proposal for the bridge as it is one of the main icons of the island, plus it would mean residents losing acres of land and pollution setting in from an increase in traffic. While the tunnel proposal is on the table, it has not been etched in stone due to opposition and costs for the project, which politicians in Berlin are debating. While the bridge is expected to handle traffic for another 30 years at the most, according to sources, work is underway to determine what needs to be done with the bridge to prolong its life further, while at the same time ensure that the island does not witness an increase in volume of traffic through the tunnel or three-bridge solution and with that, the conversion of the two-lane road into a motorway, something the majority of residents are opposed to. The Flensburg Files and its sister column will keep you informed on the developments in the Fehmarn Region. Yet the Initiative Bewahrt Fehmarn needs your help and support. For more on how to help, please go to their facebook page and contact the people involved to see how you can help.